Chromis (Tilapia) mossambicus: Peters, 1852. Tilapia mossambica: Jones and Sarojini, 1952. 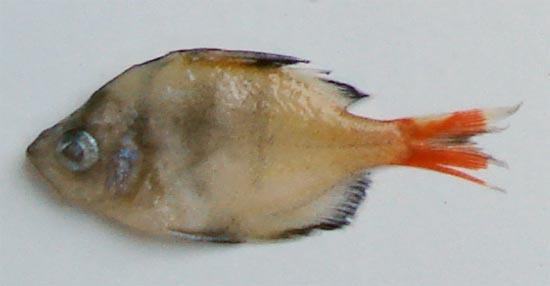 Common name: Mozambique Tilapia (English name). Ambassis ranga: Day, 1878; Day, 1889; Shaw and Shebbeare, 1937; Ahmad, N. 194; Bhuiyan, 1964. Chanda ranga: Hamilton, 1822; Menon, 1974. 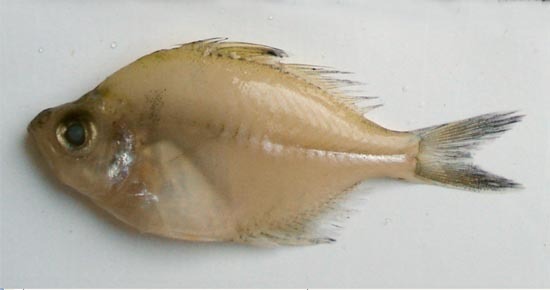 Common name: Indian glassy fish (English name). Chanda nama: Hamilton, 1822; Rahman, 1974; Bhuiyan, 1964. Ambasssis nama: Day, 1878; Day, 1889; Ahmad, N. 1943; Shaw and Shebbeare, 1937. Common name: Elongate glass-perchlet (English name). Equula edentula: Day, 1878; Day, 1889. Leiognathus equulus: Weber and de Beaufort, 1931; Munro, 1955. Common name: Common pony fish (English). Bangla name: Tak chanda, Tak mach, Taka chanda. Gobius giuris: Hamilton, 1822; Day, 1878. Glossogobius giuris: Koumans, 1953; Inger and Kong, 1962; Shaw and Shebberare, 1937; Munro, 1955; Ahmed, N. 1943; and Bhuiyan, 1964. Common name: Tank goby (English).